Make sure the SAM-e supplement you take passed our test and quality rating and is right for you! SAM-e is involved in many functions in the body and, as a supplement, has been shown to be helpful in reducing the pain of osteoarthritis as well as improving mood in major depression. But which SAM-e supplements are best? 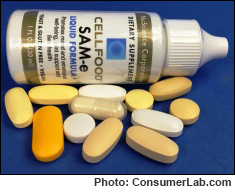 ConsumerLab.com selected 10 SAM-e supplements and tested them to see whether they contained their claimed amounts of SAM-e, and if the enteric coatings (which protect SAM-e in the stomach) worked properly. One product was discovered to contain only 77% of its listed SAM-e.
SAM-e can be expensive, with products costing as much as $3 per day. Among the products which passed testing (including three products tested through CL's voluntary Quality Certification Program), CL determined which provided the best value. It found three products which passed all tests and provided 400 mg of high-quality SAM-e for as little as 51 to 63 cents. In addition, each was enteric-coated to protect SAM-e from stomach acids and sold in blister packs to prevent spoilage from moisture, as SAMe is a sensitive compound.